Mönch is one of the majestic Bernese Alps peaks in Switzerland. 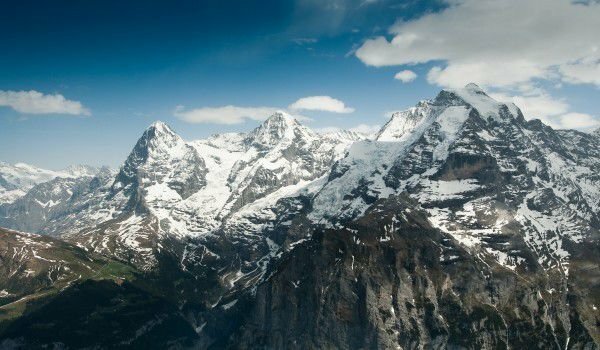 Mönch, Jungfrau, along with the Eiger form the "Holy Trinity" of climbers among the mountains of the country. They have a massive north wall, which is one of the most famous places in the Alps. Resembling the shape of a cross formed by two large mountain ranges, as one of the edges is Mount Eiger, this wall is a challenge for climbers from all over the world. Mönch and other large glaciers are part of the registered in 2001 in the List of World Heritage of UNESCO Natural Heritage Site "Jungfrau-Aletsch-Bichhorn". Peak Mönch literally means "monk" and together with the Jungfrau ("Virgin") are the main characters in a beautiful local legend. Mönch occupies a central position in the three views of the mountain top, and Jungfrau remains to the west and Eiger - to the east. The height of the Mönch is a massive 4017 meters. Mönch lies on the border between the cantons of Valais and Bern and rises west of Mönchsjoch (at 3650 m altitude) and the Mönchsjoch Hut, located just down from that peak. Mönch stands west of Jungfrau and Ewigschneefäld, which are an integral part of the Great Aletsch Glacier. The rocky north wall of Mönch lies above the valley Lauterbrunnen. The first brave men who conquer Mönch are Christian Almer, Christian Kaufmann, Ulrich Kaufmann and Sigismund Porges, this happens on August 15, 1857. Now Mönch is a climb among the top three of this part of the Bern Alps, the foundations of which are full of major winter resorts. Between the peaks of Jungfrau and Mönch lies the terrace of the Sphinx, reached easily by lift. From this terrace is a splendid view of the 23 mile Glacier Aletsch and the picturesque green valleys below. In Mönch passes the highest transport service in Europe - 3454 m above sea level. This is the rail, so-called Jungfraubahn, launched in the most attractive section of Scheidegg. The train passes under Mount Eiger, crosses the glacier and reaches the saddle between the peaks Mönch and Jungfrau. Climbing the alpine peaks Jungfrau and Mönch is a serious challenge for any mountaineer; good preparation and quality equipment are required for the exercise. Mönch is the easiest choice of the two peaks, because the last stop on the railway is just below the summit and offers easy access to attacking it. The starting point for the ascent is usually Kleine Scheidegg station which is located at 2029 m altitude or city Lauterbruner. From here take the iconic Jungfraubahn railway that leads to the area between the two peaks. This section of the railway is 9.6 km long, about 6.4 km from it is a tunnel dug in the mountains, passing through an extremely unique experience. Before you go through it there are two short stops - in Eigerwand (2830 m) and Eismeer, which is situated at an altitude of 3110 m. The final stop is the Jungfraujoch, where climbers attack Mönch. Climbing to the top Mönch offers a selection of good routes. The most popular of these is the South Ridge. This route involves climbing sharp snow-ice ridges and rock climbing on good igneous rock. Usually climbing Mönch begins with a gentle transition from the railway station Jungfraujoch, which leads to the base of the crest. From here follow easy sections of rock climbing. About half way on the crest you start addressing the first snow ridges, and then snow and rock line up, resulting in a beautiful comb, which reaches Mönch.